Sock aids are adaptive dressing equipment designed to help you pull on socks or stockings if your mobility is temporarily or permanently disabled (Source). An added benefit is that it helps disabled or elderly individuals retain their independence. They are essentially 'foot chutes' that your sock slides over, allowing you to insert your foot inside, then pulling the handle straps to pull the sock on and the sock aid itself off as it travels up your ankle (Source). 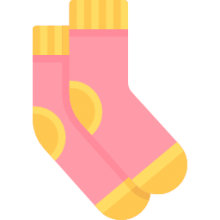 You might also want to purchase a dressing stick to help remove sock​s since most of these sock aids are good at putting the sock on, but don't help taking them off. Most of these sock aids follow a familiar format- a sock chute with rope pulleys- though the Wright Stuff Sock Aid Kit is actually a floor-mounted option that can also help you take your sock off. Check out a video demonstration of our top pick, the Eva Medical sock aid, below to see how it works. Buyers say that the Eva Medical sock kit works with a variety of differently sized feet, with one arthritis sufferer who weighs over 320 pounds with an 11-inch foot telling us that it is plenty wide for him. There have been some complaints that it doesn't work so well if your foot is over a size 12, however. Another reviewer described care-taking an elderly relative who had recently had hip surgery. They tell us that this senior citizen was quite happy to receive this dressing aid because it enabled her to do more for herself rather than bother family members- something she was somewhat ashamed to do. In some cases, if the user lacks upper body strength, it can be difficult pulling the sock on, especially if they are thick, compression socks. 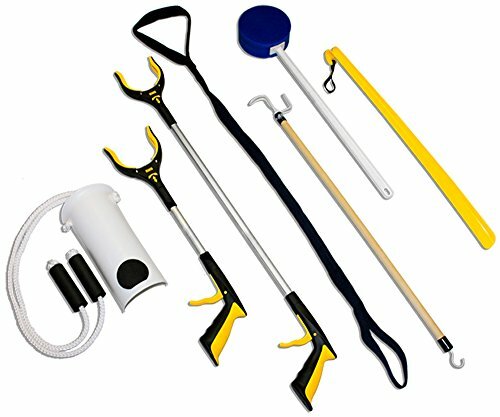 5 PIECES KIT: 1x 32" Reacher, 1x Deluxe Molded Sock Aid with 38" Long Foam Handles, 1x 28" Long Dressing Stick, 1x 22" Long Handle Round Sponge and 1x 24" Long Plastic Shoe Horn. Sock Aid Kit is the fast & easy way to put on & take off your socks or stocking. The Kit Includes: One Deluxe Sock Aid with Foam Handle and One Sock or Compression Stocking Remover / Doffer. 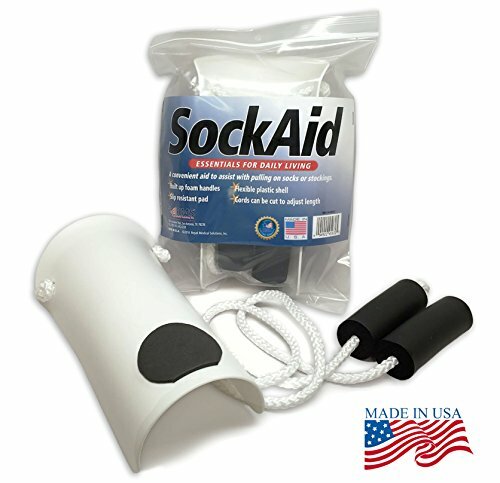 This sock aid offered by RMS is a good option for someone who needs help for putting on socks. Users love the functionality and usefulness of this product, but some do complain about difficulties with putting compression socks on it. However, some buyers complain that their socks can’t fit on the plastic piece because it is too wide.Several dissatisfied buyers complain that it is too difficult to get a compression sock on it. 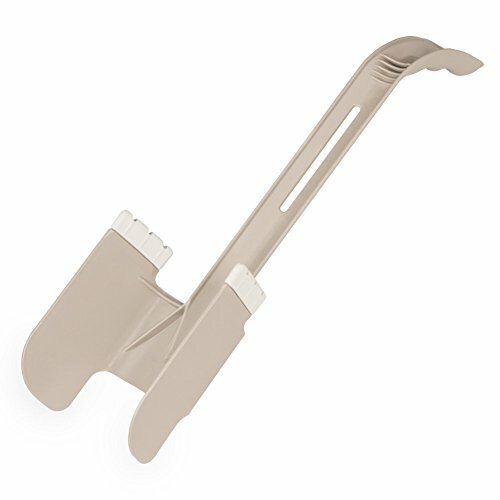 If you are looking for a top-rated sock aid, you might want to consider this dressing aid with foam grip offered by EVA Medical. Users love the usefulness and easiness of use of this sock aid, but do complain about the size and issues when using it for putting on a compression sock. This product is a dressing aid that helps pull a sock or stocking on. It can be easily used with one hand. The pad is made of a high quality material that will not peel off after repeated use. If you are looking fora dressing aid to put a sock on, this might be a good option. In general, users have a favorable opinion of this sock aid and they state that it is very useful and works as advertised for most people. They say that this gadget is easy to use and that the quality is decent. However,some purchasers complain about the size of the item, stating that your foot won’t fit into the unit if you have size 12 and up. Regarding this problem, one user advised applying a bit of heat in order to widen this dressing aid in case you have a larger foot.Some users also complain about difficulties with putting a compression sock on the sock aid. 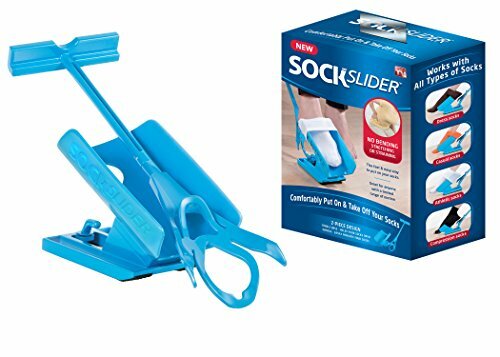 If you are looking for a sock aid, you might want to consider this one with extra-long handle offered by Sock Horse. Users like the usefulness of this tool, but do complain about it being too wide and inefficient for compression socks. This product features an extra-long handle which is great because it reduces bending and straining. The rubber grips are gentle on delicate socks and nylons. If you are looking fora dressing aid with a long-handled shoe horn, this might be a solid option. In general, users have a favorable opinion of this Sock Horse sock aid, saying that it is a helpful tool that works well with some types of socks, particularly athletic socks. Many online reviewers state that it is very easy to use. However, some buyers complain about the sock aid not doing its job when it comes to a compression sock. Several purchasers experienced problems with this item stating that it is too wide and thus stretching out socks. This dressing aid for putting socks on offered by The Wright Stuff is a good option for those who can’t reach their feet. Users like the helpfulness of this dressing sock aid, but do complain about not being able to use it for putting a compression sock on. 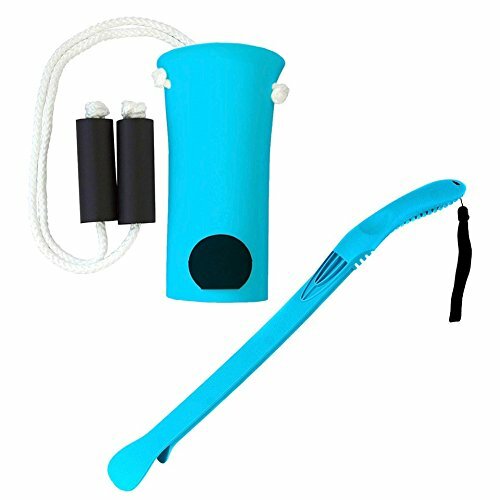 This product is used to push your sock off, and with the use of your feet you can tilt it to put your sock within reach. It can be used to remove light compression garments too.This sock assist aid could be a solid choice if you have bending issues. In general, buyers say that this easy on/easy off sock aid kit is sturdy, easy to use and that it works well with regular socks. However, buyers complain about using it for putting a compression sock on. One dissatisfied purchaser says that a compression sock pulls the sides in so much that you can’t get your foot in. This product features a loop strap that can be manipulated with only one hand and is length adjustable. A sock stays open as the three fingers gently bend to accommodate the contours of the heel and foot. This easy-to-use aid helps reduce an individual’s need to bend when putting on socks and stockings and therefore alleviates stress and the potential for a fall. This flexible sock aid might be a good choice if you have some sort of mobility impediment. In general, users have a favorable opinion of the CM deluxe flexible sock aid, saying that it is well thought out and engineered comfortable and a very useful dressing aid for the disabled. They say that it works for both socks and pantyhose. One user shares that, thanks to the choice of the materials on the top and the bottom of the sock aid, she never has to reposition her foot in a sock when using this sock aid. However, some buyers complain about the material covering the dressing aid because it fell apart at the seams after only a couple of months. One dissatisfied user states that getting a compression sock on this sock aid takes a lot of work, while another one finds the material hard for her to bend to get the end of the sock. The first sock aid we examined is manufactured by royal medical solutions. It is a USA-made option designed to help you or a loved one to pull on stockings or socks. 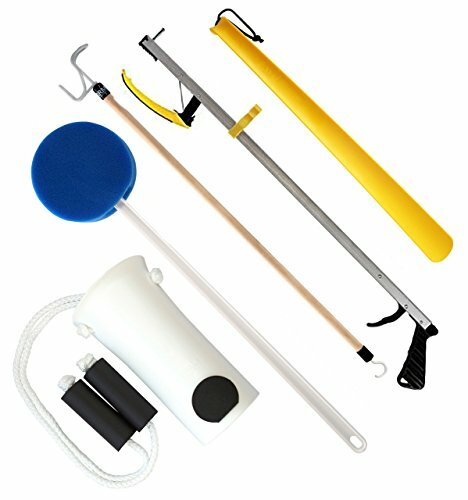 It has rope cords that measure 36 inches and after they have been knotted to hold the foam handle securely they measure about 33 inches. The foam padding at the end of the tube is designed to ensure the sock does not slip off during the process. One buyer we interviewed who suffers extreme pain whenever he has to bend over told us that this medical assistance device has allowed him to retain a great deal of his dignity and independent living. The way they work, you just need to slide your sock onto it, then slide your foot into it, use the integrated handles to pull and your sock will magically be on your foot. One buyer with a large foot, bigger than a size 13, says that it has been effective for him, enabling him to pull socks all the way up his ankle and leg. 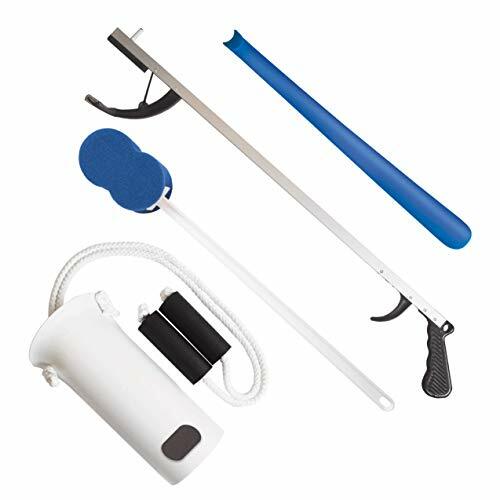 Another reviewer who lives alone with a variety of medical impairments, including arthritis, that has robbed her of mobility and flexibility tells us this was a necessary purchase that has helped her immensely. On the downside, one reviewer who is handicapped by cervical and spinal disorders says that she lacks the upper body strength to pull the handles to fit the sock to her feet. The second sock aid we examined is provided by CM. It's marketed as a convenient dressing aid to help men and women put stockings and socks on, all in a painless manner that decreases the chances of taking a dangerous fall. The loop strap is designed to be length-adjustable and employed by one hand at a time. Some buyers wondered whether they would work with compression socks and stockings, with the general consensus being that for heavier compression socks it's too thick- but with lighter ones that can work. Some buyers who suffer from rheumatoid arthritis in their hands say that they've been able to use this device despite their impairments. Another buyer described this sock installer as a minor marvel- an indispensable medical aid if you have had surgery that limits your mobility, particularly if you are now unable to bend over. Other buyers say that since the interior is cotton-lined, the foot slides into the sock pretty easily. Another reviewer says that this dressing aid functions as a sock chute and provides a non-slippery way to painlessly attire yourself. Another reviewer who had been frustrated by cheap options that were difficult to use or that eventually broke praised this as an indispensable dressing aid for elderly and disabled people. Another physically challenged buyer says that it has effectively helped them to dress in the morning whether it be pantyhose or stockings that otherwise would've been an impossible task to do alone, or would've required assistance of a caregiver or family member. The third medical sock aid we examined his manufactured by EVA Medical. One buyer did have a criticism, saying that if your foot is larger than the size 12, it may not be wide enough for you. And another frustrated user says that if you lack upper body strength and also need to pull on long compression socks that it is quite a challenge and may not work for you either. The fourth sock aid kit we examined is manufactured by the Wright Stuff. This particular dressing aid in a little bit different- it's like a floor mounted chute but let's see you slide your foot in and out of the sock tube. This helps to remove the sock as well as put it on. Another reviewer says that after a hip replacement, during a somewhat lengthy recuperation, this dressing aid became an indispensable part of her recovery arsenal. Some buyers who had larger feet said it was a little bit difficult to use and another reviewer criticized its expense. The last option we examine was the Sock Horse Aid- it is a USA-made option that is marketed as the fastest and most effective sock tool available. Buyers say that it is a two in one device- functioning as a sock aid and shoehorn- in the opinion of this buyer who had undergone a total knee replacement, a solid buy. 2. Support the sock aid from the straps with each hand. Initially, complete it for the foot of the leg that has been damaged or had surgical treatment. This is known as the afflicted or weakened leg. While retaining the straps, lower the sock aid to the ground before the foot on your weakened leg. 3. Slide your foot into the sock aid. After that draw on the straps to drag the sock aid on your foot. 4. Draw right up until the sock is up your leg. Continue to keep pulling until the sock aid is released of your sock. 5. Stick to the exact same steps to place a sock on the opposite foot.